If you own a front-loading washing machine, this scenario or its variant may be a familiar tune: you load up the washer, start it and on your way back to the room, you find a sock or a shirt that you dropped in your mad rush to get the chore done. With most top-loaders, this would not cause an issue—just lift the lid and throw the stray sock in to catch up with the others in the cleansing maelstrom. With a front load washer, it's a different story. You need to pause the cycle and wait for the machine drain out the water in the tub, then the tub needs to refill itself again before starting, wasting both time and water. To get around this problem, Samsung literally opened up a door in its newest washing machine, the Samsung Front Load Washer with AddWash (model WF50K7500AV). A simple, but elegant, solution to a common problem. Expected to be available this spring, the new laundry machine comes with an extra door on top of the main one. That stray sock can enter this door anytime during the wash cycle. You will need to pause the cycle first — with the press of a button — to unlock the door. You can also pop in more detergent or fabric softener through the access door. So, you no longer need to drain the washer and open the main door just to add in extra stuff. And, to prevent the little ones from checking out the wondrously attractive (often colorful) spinning mass inside, Samsung has added a child lock to its latest Front Load Washer with AddWash. 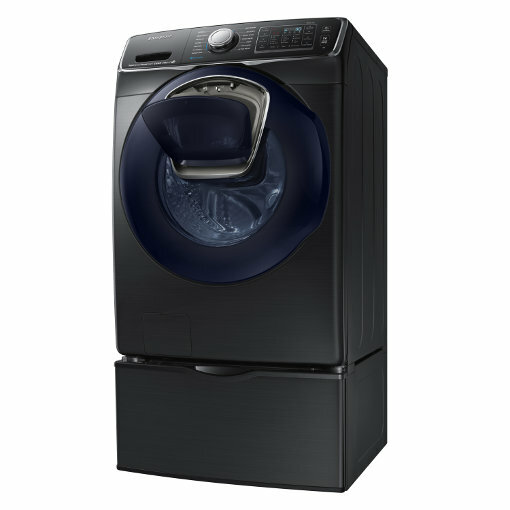 The 27-inch Samsung WF50K7500AV can accommodate about 3.6 baskets of dirty laundry in one load, thanks to its 5 cubic feet capacity. The Front Load Washer with AddWash also incorporates technology for handling delicate fabrics, maximizing detergent action and finishing a full load in less than a half hour. These mean that you can get even your toughest laundry done in a very short time. Meanwhile, for those who prefer top-loading washers, Samsung’s activewash Top Load Washer with Mid Control (model WA50K8600/AV) comes in a new design, with the control panel now optimally positioned flat on top of the machine. The control panel features a digital touchscreen built into the lid itself. Aside from that, the model includes a larger and deeper sink, allowing for bigger pre-treatment space. Like its latest front-loading model, Samsung’s top-loading machine will be available this spring together with a matching dryer featuring the same flat control panel on the lid. Many users prefer front-loading washers because they function more efficiently and use less water than regular washing machines . A front-loaders’ drum needs to be only partially filled with water, usually about half the amount used by top-loaders. Most front-loading washers also spin faster, which means washing gets done faster while reducing moisture — and power consumption, too, especially if you see an Energy Star seal on the chassis. with the lg front loading washer, you just hit the pause at any time during the cycle, it unlocks door, you open said door and add whatever you want, close door, and it resumes, no water needed to drain. no extra door needed like what the article implies. Yes you can add clothes by hitting the pause button however the water level drops before you can open the door and then must refill to continue the cycle. The Addwash does not require a drop in water level to add clothes. Saves water and energy.